It's Fine but is it Art? .. and where might its boundaries lie? 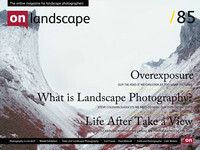 Landscape photography receives little wholly positive press in the newspapers but most coverage of photography in general is neutral to positive. However, over the last few weeks a certain journalist from The Guardian seems to have taken the reins from Brian Sewell and ridden full blast into the anti-photography hall of fame. “photographs on the page or screen are fascinating [but] look stupid when framed or backlit and displayed vertically in an exhibition”. Now the correct response to articles and quotes like this is to tut and ignore but that makes a poor article so.. The biggest issue with the article is that he provides no evidence of thought whatsoever. “They look stupid” “They are a poor substitute for painting” but then says the images would be “Beautiful and compelling” on an iPad - contradictory? Jonathan Jones is essentially saying “I don’t like photography so it’s crap”. This would be laughable if his opinion wasn’t published in a major column in a respected national newspaper. So now black and white is just a ‘special effect’ as well <sigh>, and there’s more.. So we now aren’t allowed to use features of the natural world in our pictures? If we’re recording a natural phenomenon is it in some way just another affectation? Hang on though - isn’t the whole world a natural phenomenon? So now the picturesque has been positioned as the antithesis of high art. Tell the galleries to burn their Constable’s, Gilpin’s, Ruskin’s and Gainsborough’s right now! In all it’s just incredibly disappointing that Mr Jones can’t even spare the brain cells to put some ‘oomph’ behind his argument (for all Brian Sewell’s faults at least he managed this - and he liked bacon .. mmmmm). At least if Mr Jones were to construct a framework that backs his point up I might feel challenged enough to think about what art is and why photography can fit the bill, and the article might get some constructive discussion going, but instead we come away with a knee jerk feeling of outrage - and this is exactly what Mr Jones wants. at least with clickbait you know you’ve been had pretty much straight away - Mr Jones is a troll, pure and simple. If you’ve ever been tempted to click on those links at the bottoms of web articles that say “5 People You Won’t Believe Exist” with a picture of a massive foot with a womans head then you get an idea of what Mr Jones is doing here - it’s called Clickbait and it’s just designed to get people to talk about he article. Actually it’s more insidious than that - at least with clickbait you know you’ve been had pretty much straight away - Mr Jones is a troll, pure and simple. How do we know this though? How can we be sure he isn’t completely serious in his dismissal of photography. Just take a look at this article.. Sounds like a different person! "If this is the most valuable “fine art photograph” in history, God help fine art photography." UPDATE 1: I think the Guardian have noticed the extreme backlash and let Sean O'Hagan respond - nicely written. UPDATE 2: The Independent weighs in..